This pairing of sweet apple juice and spicy curry powder makes for a salad that’ll have your taste buds talking! This butternut squash recipe is so unique and festive, it will make a wonderful holiday side dish to any Christmas, Hanukkah or Kwanzaa dinner. With just 3 Points per serving, this is one filling Weight Watchers Salad Recipe that is sure to please your dinner guests and yet still help you stay within your daily Points range. Plus, it’s incredibly healthy — low in calories and fat and packed with fiber, vitamins and antioxidants. This dish is so deliciously flavorful and colorful, I’m betting it will become a squash recipe that you’ll end up preparing more than on just the holidays! The thing I love most about it is that it’s so easy to prepare and yet so impressive! – much better than the traditional, albeit slightly boring, green leaf salads. 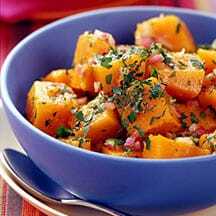 And if it’s a good Kwanzaa recipe that you are looking for, this butternut squash salad will be a wonderful compliment to your meal. This Weight Watchers Holiday Recipe is sure to dress up any dinner table this year, so make sure to give it a try! Cut squash in half crosswise where it starts to widen (where the round “bulb” meets the “neck”). Place both pieces of squash cut side down in prepared pan. Bake until bottom half of squash is just tender when pierced with a fork, about 20 to 25 minutes; remove bottom half from oven and set aside. Bake top half of squash until just tender, about 15 minutes more. Remove from oven and cool. Peel and seed cooled squash; cut into 3/4–inch cubes. Place in a serving bowl and toss with dressing. Makes 6 servings.